Thanks to ship-style bunks and a plush sleeper sofa, this bright 1BR beach condo can accommodate up to six guests. Modern tile floors line each room, and dark wood furnishings add a classy touch. The well-equipped kitchen makes preparing home-cooked meals a breeze. 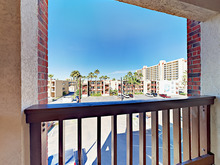 Hit the beach in no time, with access just a block away. Find great eats and a lively atmosphere at Kelly's Irish Pub down the block. Get your morning coffee fix at Cafe Karma in 2 blocks. The welcoming living room is furnished with a full-size leather sleeper sofa. After a fun-filled day at the beach, kick back and watch your favorite shows on the 48” flat screen TV. The fully-equipped kitchen has an open-concept layout, dramatic black appliances, and a roomy double sink. Three can enjoy morning coffee at the spacious breakfast bar, with room for four at the dining table. The bedroom offers a queen-size bed and 26” TV. And kids will love the ship-style sleeping space in the hallway, with a twin-over-twin bunk bed. The bathroom features a tub/shower combination and a granite vanity. Guest amenities include parking for one car, complimentary Wi-Fi, and access to the secluded complex pool. Walk to the sand and surf in minutes — ocean access is a minute away at the Fantasy Circle entry point. Cool down after a day in the sun with a delicious concoction at Groovi Smoothi 2 blocks away, and don't miss Kelly's Irish Pub for dinner and drinks right up the street. SPI Kiteboarding has you covered for paddle board rentals within a 4-minute walk. If you’re looking for an afternoon in town, you’ll find several unique boutiques within a mile on Padre Boulevard.